Nina and her husband live simply and off grid in the Santa Cruz mountains in California. She bikes a few miles into Scotts Valley, where she catches a bus to her job at the San Jose Tech Museum of Innovation, where she designs exhibits. Although we sometimes ride the bus together, I only knew her as “yellow vest girl.” We met later at the local Climbing Gym where we exchanged contact info and she agreed to be profiled for Commute By Bike. CBB: How did you get started in bike commuting? 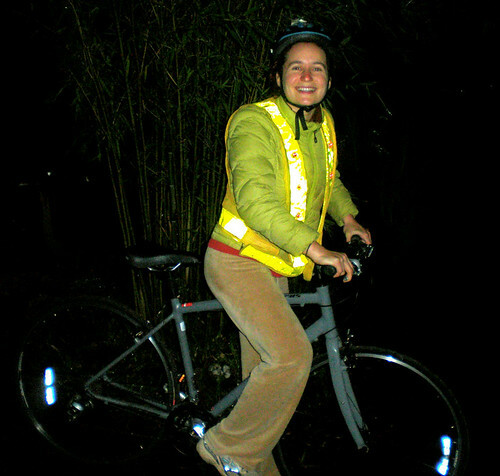 Nina: I fell into bike commuting unexpectedly. I was never a biker–recreational or otherwise. When I moved to DC in 2003, I hadn’t ridden a bike since junior high. But I moved into a coop in DC with more bikes (11) than people (8) and it seemed like time to start. I started with a random free bike that was kicking around the garage, moved on to $50 Craigslist bikes, and after a series of unpleasant accidents and thefts, have now resettled in Santa Cruz CA with a new Sirrus hybrid. DC fully indoctrinated me as a bike commuter, despite getting slammed badly a couple times, including once when I woke up in the hospital with a “suspected” broken neck (luckily, I walked away just fine). DC is just the right size for biking, with a smattering of nice car-free paths scattered among big, wide streets. When my husband sold his first company, we celebrated by buying a tandem. And the very first purchase I made in CA when we moved was my new bike. Tell me about your commute in DC. When I lived in DC, I worked for the International Spy Museum downtown, biking 4-6 miles each way a few days a week, running to work the other days. I was constantly making the tradeoff between distance and volume of crazy cars. After the worst accident, I stopped biking for several months, switching to a hybrid running/rollerblading/bus commuting system. But ultimately, I wanted the flexibility of the bike, and switched to slow, old bikes with great brakes. I bought an extremely dorky, fabulous construction vest that combines yellow reflective material with embedded blinking red LEDs. What I lacked in speed I made up for in confidence, or dumb hope, that I would be seen by drivers. DC is hot and gross in the summer, cold and windy in the winter. There’s nothing like the feeling of the breeze zooming past you on a bike headed downtown in the summer, but in the winter I preferred the warmth of a run to the icy wind on the bike. What about your commute these days? Now in Santa Cruz, I commute by bike plus bus three days a week, drive the other two, somewhat dependent on evening plans on either side of the hill. Biking means leaving home at 6:30am, relying on my headlamp as I plunge downhill through the redwoods of our small valley, and then onto 2 lane canyon roads that wind uphill through vineyards and rooster calls. I see about 5 cars until the last half mile when I get close to the bus stop in Scotts Valley. Then, an express bus ride to San Jose, off at the first stop, and a quick, flat mile to work. It’s a lovely ride, with killer uphills in the morning, easy coasting at night. I’ve only been doing it since November, and the darkness is the only unpleasant part. I look forward to experiencing it in the warmer, lighter months to come. Neither SPY nor The Tech provide any particular facilities for bike commuters. Fortunately, SPY had a shower. Unfortunately, I had a bike stolen once locked right in front of that museum. At The Tech, I’m blessed with a big enough office on a ground floor that I can easily store my bike inside. I think it’s fascinating how you live. We live in a cabin at the top of a small road in the Happy Valley area. It’s high tech/low tech living: my husband runs a virtual worlds firm (The Electric Sheep Company), I lead a virtual exhibit design program for a large museum, and yet we live in a home that runs on 12V batteries powered by solar panels. We are completely off the grid, using solar for electric lights, propane for the hot water heater and stove, and a wood stove for heat. We have composting toilets (buckets, really) and a gray water system for disposal of sink and shower water. It’s more rustic than high-tech green, and we look forward to making several improvements over the next few years to upgrade the solar, eliminate our reliance on propane and headlamps. We started 2008 with a big step in that direction–digging the trenches needed for cable internet. But in general, we love living 4 miles from downtown Santa Cruz in a place that feels like its own little world. When we first moved to Santa Cruz, I expected to work from home along with my husband. I run the blog Museum 2.0 , which focuses on ways that museums can evolve into more user-centered, flexible, open institutions, and I’d planned to spend my time consulting for several museums and experience design firms. That made for a great summer, but when the job at The Tech came up I couldn’t say no. Solving the commuting problem (i.e. not wanting to drive over the hill every day) was a necessary challenge. While I can’t say I enjoy the fact that the bike and bus commute takes 1.5 hours each way, I sincerely love the opportunity to bike through the woods largely uninterrupted by cars. It’s a far cry from the shorter but much higher stress biking I did while living in Washington DC. You “have to” commute by bike/bus 1.5 each day?! Lucky dog. Her bike commute is something like 30 minutes, I think. The bus ride is usually around 40 to 45 minutes. There’s WiFi Internet on the bus, but I don’t think Nina carries a laptop with her. Great interview, and I’ve passed it around to a few bike friends too! Cheers!! Nina and her husband make the forecast for the 21st Century considerably brighter. They light up the world! Hallelujah!